This is the inaugural post in the “Best Books” forum. 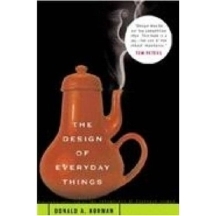 I selected “The Design of Everyday Things” by Don Norman for three reasons: 1) It’s excellent; 2) The principles expressed within it are relatively simple but profoundly impactful; 3) I read it recently, so it’s been on my mind lately. This book was originally published in 1988, and has since sold more than 100,000 copies (as the cover proudly asserts). Somehow I managed to miss reading it for 18 years, but finally stumbled onto my own copy just last year. I found it moving, motivating, and life changing. Even more than that I found it affirming as a user of the world around me. As someone with a Ph.D. in Computer Science I’ve had the repeatedly uncomfortable experience of helping someone with some random, poorly designed program or device, and they look at me like my background and education will allow me to divine the purpose and processes that underly a pitifully designed piece of whatever. Alas, my doctoral research was not in bad design or horrible user interface. But alack, much of my experience as a user is! Even more demoralizing is witnessing a user being systematically dehumanized by software, or by some device. I watched a desk clerk stumble through a pitifully designed program, running on Windows, and then watched her look up at me, completely defeated, and apologetically murmur, “I’m just not good with computers.” I looked back at her and said, “Maybe it’s the program that’s stupid. Maybe it was poorly designed, and that’s why you’re struggling to do something so simple.” Her look was priceless, like this idea had never before dawned on her in her entire life. Norman talks about door knobs, light switches, keyboards, and lots of other everyday devices that routinely drive us nuts. You get the idea. I don’t care what you do for a living. Read this book!